Same simple design, user-friendly features, and proven quality as the 300X series in asmoother-running, stronger, lighter version. 300Xe offers an 8-bearing system including instant anti-reverse, polymetric body and rotor (stronger than graphite) with Comfort Touch™ body coating, high-performance gearing, NeverFail™ bailspring, line twist reduction system, and multi-disk drag stack. FREE spare spool. "I'm not sure about the other sizes but I bought the smallest size 310 for fishing trout and panfish. 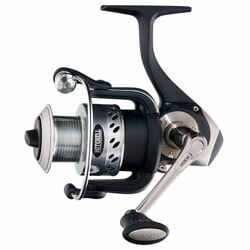 The reel felt smooth but the line would occasionally wrap its self on the top of the reel where you can adjust the drag. " "This real is alright, but for $10.00 or so more, there is a better reel. When I first bought a new rod, I of course needed a new reel, so I went shopping for something that is good but not to pricey, and it came down to the Shimano Sahara" or the Mitchell 300xe." "I have the Mitchell 300Xe and the Mitchell 310Xe both are excellent! I first purchased the 310 for my ultra light then when it came time to replace my medium I new where to go." "I bought this reel as part of a combo. The reel is reasonably priced for what you get. I have had no problems with birds nests, in my opinion you need to look at your line before you blame the reel."